In 1917, when a name had to be found for a fossil plant in the Rhynie chert, Kidston and Lang chose Rhynia Gwynne-Vaughani in honour of their deceased collegue, Gwynne-Vaughan . They were not aware then that the fossils did not represent one species but two. They found out soon and assigned the name to the smaller one . (Later, the spelling of the name was slightly modified into Rhynia gwynne-vaughanii.) The bigger one got the name Rhynia major and kept it until 1984 when it was arguably re-named Aglaophyton major . Some confusion apparently resulting from the repeatedly changing names is felt even today. If one sees a dozen or more rather well preserved circular cross-sections on one square centimetre, with diameters of 1-2mm, occasionally with a bump on the circumference, it is surely Rhynia. No other Rhynie chert plant offers such aspect. 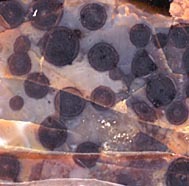 Image on the right: Rhynia cross-sections on one square centimetre of cut chert face. 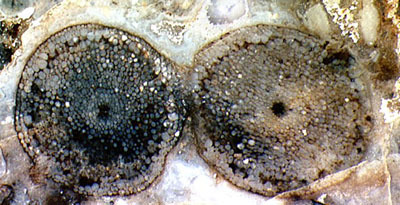 Image on the left: Rhynia, cross-section of forked shoot at a position where the branches are not yet fully separated. (Forking at an acute angle is not the only branching type observed with Rhynia.) Note also the well preserved tissue. More often than any other species in the chert, Rhynia is seen with well preserved tissue. Like other plants, Rhynia is less easily recognized when deformed or shrivelled. Seldom seen axes with wart-like bumps bearing rhizoids seem to be rhizomes. Rhynia does not form arches to creep over the ground as Aglaophyton does. As another difference, symmetrical U-shaped branching, which is typical for Aglaophyton , is probably absent with Rhynia. Despite of the differences, Aglaophyton and Rhynia are more similar to each other than to any other plant in the chert. Trans. Roy. Soc. Edinburgh 52(1920), 603-27.